TEL AVIV – Two Palestinian security officers were killed in a gunfight with militants in Nablus over the weekend, further raising concerns that the West Bank is sliding into anarchy. A Palestinian security source told Breitbart Jerusalem that a Palestinian Authority security unit rushed late Thursday night to break up a roadblock erected by a family of suspected murderers in protest of their arrest. Upon their arrival, they were met with gunfire, leading to the killing of two and the injury of another three. Backup was sent from across the West Bank, and the troops raided the Old City of Nablus and the compound where the suspects’ family reside. Two gunmen were killed and more than 10 were arrested. Large amounts of weapons and ammunition were also discovered. Prime Minister Rami Hamdallah held emergency meetings with the PA’s security commanders, conveying President Mahmoud Abbas’ orders to bring the killers to trial. PA troops continued to search for the suspects and weapons over the weekend. Government spokesperson Yussef Almahmoud said that many were arrested and large amounts of weapons, originating in Israel, were seized. 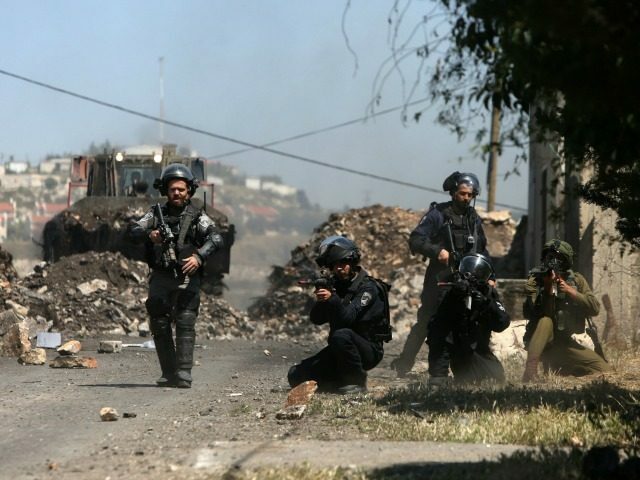 A civil society employee in Nablus told Breitbart Jerusalem that the residents of the city support the PA’s iron-fist policy after gunmen effectively took control of the city. “Whether it’s just a momentary reprisal for the officers’ killing, after which things will return to anarchy, or the PA manages to take control of the situation and curb the illegal use of weapons remains to be seen,” he said. Breitbart Jerusalem has reported extensively on the deterioration of the security situation in the West Bank, and that even officials within Abbas’ Fatah movement have hired and trained private militiamen, fearing the possibility of anarchy. Last month, a similar incident occurred, in which two security officers were killed in Nablus in a gunfight. The interest of Fatah officials in paramilitary power results from their anticipation of an imminent power struggle following Abbas’ rumored departure.